Article on the ease with which drivers will take up electric cars. It all sounds plausible to me. A piece of kit that is expensive and used by a minority (bicycles in the 1880s, cars in the 1900s, mobile phones in the 80s) becomes cheaper and in reach of the average person. My own beef with cars isn't so much their emissions but the amount of space they take up and how their convenience has destroyed our cities. The window rolls down, doesn't it? It does, but we only ever got the damn things out in the depths of winter when the other ambulances couldn't get up the hills. It was considered poor form to turn up at people's houses with snow *inside* the vehicle as well as out. Read interesting letter about energy needed if we were to use electric cars in same way as our fossil fuelled cars. Long range Nissan Leaf battery stores 30kwh. Range of 100 - 120 miles. Average car travels 10,000 miles a year (apparently). 25 million cars (assuming we have same number as now) would need 200Gwh per day. This is more electricity than we can produce easily without a large increase in generation (UK figures). If he's right then we have a problem? @LaidBack - I see it as a choice between two problems. First, the status quo means high emissions leading to health issues especially in cities. It also is more energy intensive than the alternative. The EV generation issue to me is more manageable and attractive. Centralised electricity generation increases efficiency and opens the door to carbon capture in case of fossil fuels, and a mix of renewables. The other exciting part is the potential to use the network of plugged-in cars as power storage for the grid - reducing the total generating capacity requirement as daily peaks and troughs get flattened out. "Centralised electricity generation increases efficiency"
I suppose it depends what is meant by centralised, but surely the 'future' is renewables which are likely to be more spread out also the prospect of smaller ones serving local areas. "the potential to use the network of plugged-in cars as power storage for the grid"
That is certainly an interesting potential 'byproduct'. Yes. General trend is away from centralised generation and passive consumption towards local energy systems. This is spot on - renewables (esp wind and tidal) will be generating electricity during the night when there isn't currently much demand, so there's a big push for developing battery technology to store it. Loads of electrics cars, buses, vans plugged in overnight will give us somewhere to put it. There's undoubtedly a lot to do to redevelop our energy infrastructure to met further needs and whilst significantly reduce emissions. Given that the UK government is currently diverted tackling Brexit and the not-so-good history of UK governments in tackling long-term problems, I'm not so hopefully that the necessary progress will be made on time. Plus it's all reliant on technology gains - are we guilty of taking this for granted. I can't see the mass-production of cars at the current level being sustainable anyway. The energy required for build, transport and recycling is substantial and the materials have to come from somewhere. Our street of 3 bedroom houses seems to have 3 cars parked outside most. Truelly clever solutions would enable people to dump the car without much pain. Here's an interesting article that's (partly) about lithium-ion batteries, and where the raw materials might come from to manufacture enough of them. "China has much of the world supply of raw materials"
In China or its 'colonies'? "and it does not intend to export them as such"
Presumably, increasingly, that will be true for more countries wanting some sort of 'value-adding' industry in addition to mining. The Tesla thread is especially interesting following the roll out of the Model 3 to actual customers (albeit just ones that work for Tesla for the time being) last week. Although if regenerative braking can be taken to the point of replacing physical brakes, then electric cars would only be causing pollution locally from tyre wear. "Although if regenerative braking can be taken to the point of replacing physical brakes..."
You'd need to add a special lever to deploy chocks around the wheels on slopes and suchlike. 56% of PM pollution from vehicle tyres and brakes wearing away. Shifting to walking and cycling best solution. "Bike tyres and bike brakes would also produce some PM as would shoes"
Hub brakes are totally enclosed and don't produce any PMU. Such a small surface area of a bike tyre is in contact with the road, I imagine PM2.5 emissions will be negligible. Seriously though, probably time to start clamping down on coal fires, wood burning stoves and the like. London already plans to introduce stricter controls. Came across BBC Alba Air an Rathad show this week. This was an electric and alternative fuel car special. Speed and style were a main concern for presenters. Range too of course. A BMW came top. Nissan Leaf was far too boring. Interesting insight to what younger drivers feel. Fashion and marketing will get sales up. That and more public subsidy for private transport! Tesla was launching their new articulated lorry or semi as Americans call them, but it's not at all surprising that the media is focussing on the new Roadster that was brought out at the end. They claim that a fleet of electric semis in convoy will be more efficient than a train (engine style not cited so not sure if this is a direct comparison with an electric train or not). Lesley Riddoch chairing. May arrive with coolbox UA to show how E-bikes can be used in cities. EVs won't solve congestion plus issues debated here on this thread. @Rosie - My own beef with cars isn't so much their emissions but the amount of space they take up and how their convenience has destroyed our cities. Very well attended event. Users of EVs are a very passionate bunch but more open to looking at other means of transport too I reckon. 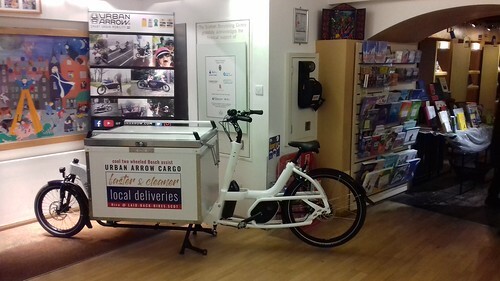 We parked two Urban Arrows inside the Story Telling Centre - staff there very helpful. This was to show EV crowd that E-power could be applied to local transport without taking up street space. Speaker Petter Haugneland, Communications Director of the Norwegian Electric Vehicle Association does not own a car. He uses his e-bike around Oslo and it turns out he had already test ridden a UA from dealer there. 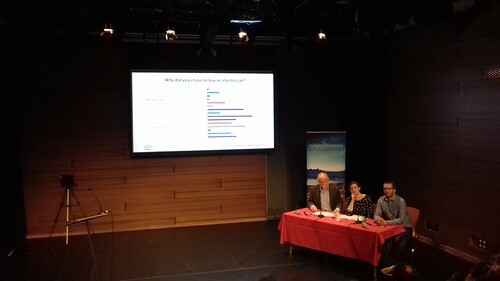 His presentation showed how the massive incentives in Norway to get people to choose EVs have resulted in around 35% of vehicles being EV or hybrid. The Norway EVA has 50,000 members. The Scottish EVA has 700 with around 1.5% vehicles being EVs. - Norwegians do not pay any VAT on EVs and this 25% reduction in price makes a VW E-Golf cheaper than the petrol equivalent. - EV owners think their cars are environmentally friendly as Norway's Hydro schemes churn out power all night. So in effect they are using off-peak power. Counter arguments a-plenty came from audience. With fuel poverty it would seem odd to allow people to travel for nothing in a private vehicle while paying for heating. Ethics of mining for materials. Costs of making an EV. Will the EV boom mean we can't change cities to be more people orientated with active trave? Norway does have desire to get more people cycling E-bike sales are going well there although these are Vatted. In Oslo though they are providing incentives. 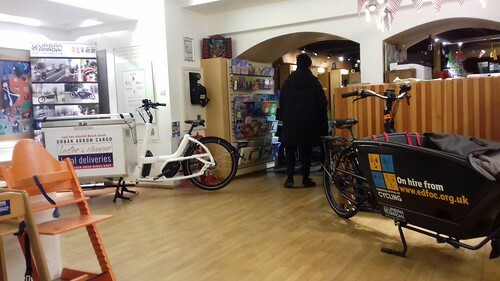 "Most of the in-Norway sold e-bikes retail for about NOK 20,000 (€2,200). Residents of Norway’s Capital Oslo however can obtain an electric bicycle for much less. The city council is supporting cycling and offers a NOK 500 (€550) subsidy for residents buying an e-bike. The talk can be seen here. Lesley Riddoch is still recovering from a hip operation so wasn't able to chair. @LaidBack thanks for the report. I was busy elsewhere last night, but would most likely have come along otherwise. I presume Norway are able to not charge VAT on EVs due to the fact they are not in the EU? Pretty sure the EU are in firm control of VAT on products for their members.